Two Rivers, Wisconsin. Photo: Thomas J. King. Photographer Thomas J. 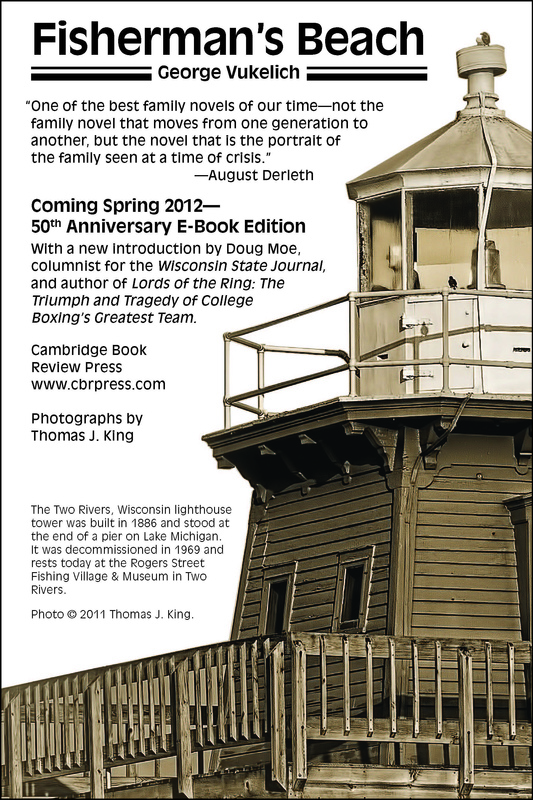 King has captured some spectacular images from his visit last week to Two Rivers, Wisconsin, the setting for George Vukelich’s 1962 novel, Fisherman’s Beach. King’s work will grace an ebook edition of Vukelich’s novel that CBR Press is publishing next spring. The Two Rivers, Wisconsin lighthouse tower was built in 1886 and stood at the end of a pier on Lake Michigan. 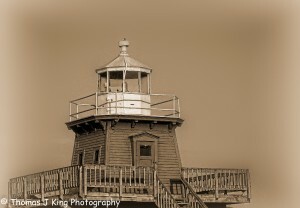 It was decommissioned in 1969 and rests today at the Rogers Street Fishing Village & Museum in Two Rivers. 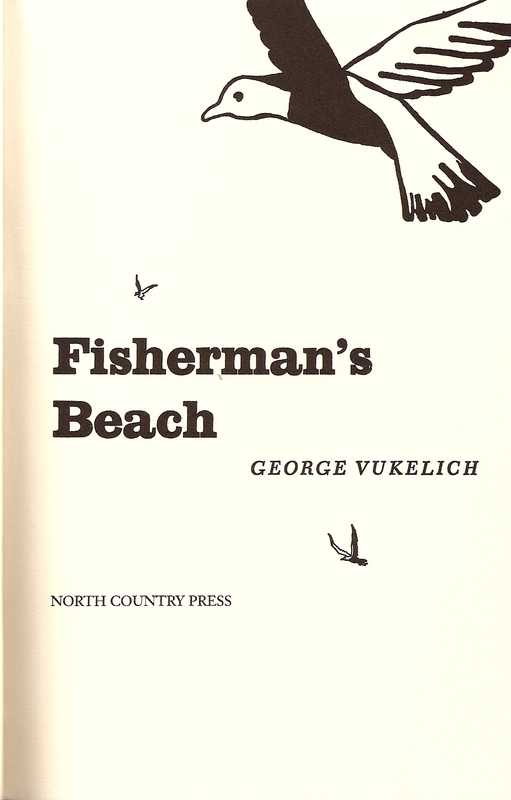 Cover to the 1990 reprint edition published by Vukelich’s North Country Press. 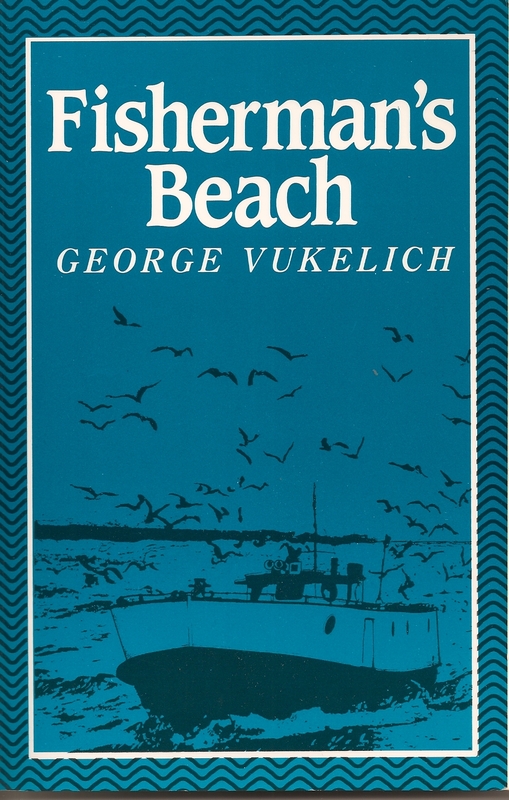 Cambridge Book Review Press is delighted to announce that digital rights have been secured to publish a Kindle ebook edition of Fisherman’s Beach, the masterful novel by the late Wisconsin author and long-time Madison newspaper columnist and radio-host George Vukelich (1927-1995). Originally published in 1962 by St. Martin’s Press, Fisherman’s Beach is a remarkably assured debut novel charting the postwar struggles of a Catholic fishing clan in Two Rivers, Wisconsin. The family is headed by a dying patriarch, Old Man LeMere. Often at odds with his Irish wife, his five sons, not to mention his doctor and his priest, LeMere represents a tradition and moral force that seem to be breaking down around him. Writer August Derleth, with whom Vukelich studied following a stint in the Merchant Marine during the Second World War, said that Fisherman’s Beach is “one of the best family novels of our time—not the family novel that moves from one generation to another … but the novel that is the portrait of the family seen at a time of crisis.” Vukelich’s sturdy naturalism has kept the novel’s style timeless and fresh. And in its depiction of a family business battling state politicians over fishing rights, Fisherman’s Beach touches on an all-too-contemporary Wisconsin theme: political power and its abuse. 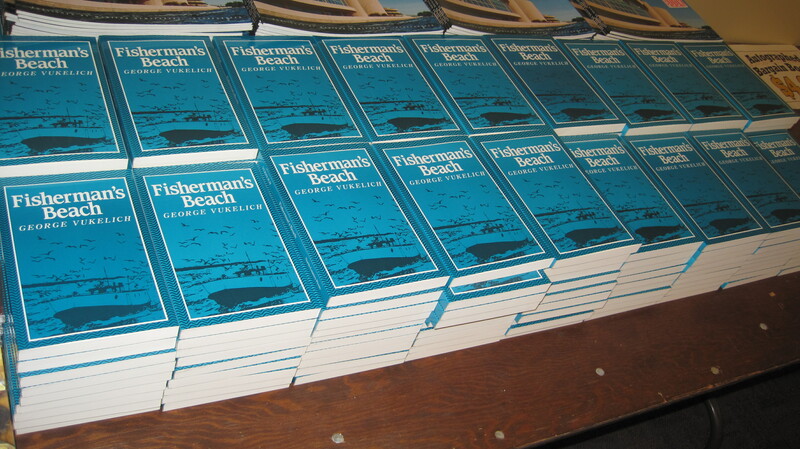 Watch for Fisherman’s Beach in ebook format coming in spring 2012 from Cambridge Book Review Press. Talk about a catch of the day. 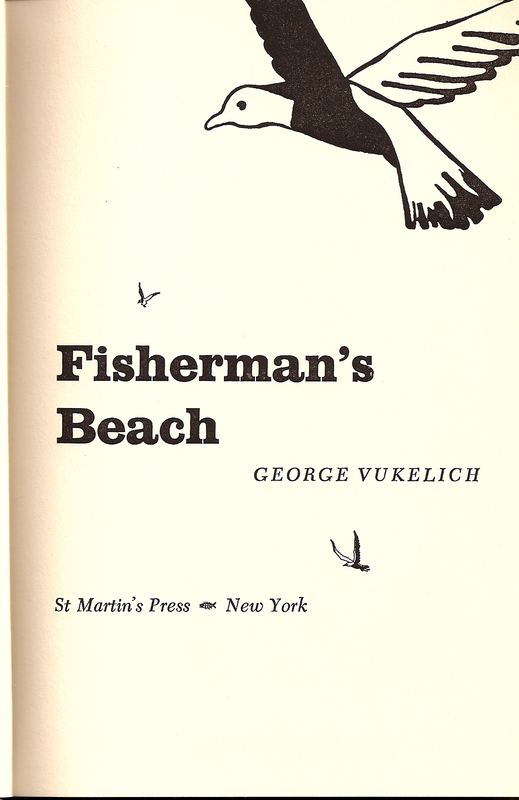 How about netting 175 remaindered copies of George Vukelich’s masterful 1962 Wisconsin novel, Fisherman’s Beach, selling for ninety-eight cents each on the bargain table at the UW Bookstore at Hilldale in Madison. Originally published by St. Martin’s Press, the novel was reprinted in 1990 under Vukelich’s own North Country Press imprint, which is the edition UW Bookstore is selling. It seems likely that Vukelich, who died in 1995 at 67, had access to St. Martin’s original printer’s plates. There’s a striking use of pen and ink seagull silhouettes on the cover, title page and chapter headings, as well as a small fish icon beside each page number. It’s the kind of elegant layout and textual design that was common enough in 1962 when publishers had in-house graphic designers, but seems like a classical lost art form today. They spent half an hour getting the tug ready for the run out to the fish grounds. Out of the shanty gear shack came the empty fish boxes they hoped to fill by noon. Raphael and Gabriel lugged these aboard while Roger gassed up the tug and Germaine carried out the foul-weather gear. They moved quickly, quietly, anxious to have the joework over with and be underway. Once they cleared the dock, they could relax and smoke during the seven-mile run back up the coast to the nets. Now there were hundreds of pounds of ice to be put aboard and steel oil drums into which they could fling the trout guts when they cleaned them on the way back. The offal would be sold to the area farmers. It wasn’t much but every little penny helped now. The plot is set in motion when the oldest son, 35-year-old Germaine, returns home to Wisconsin from living abroad after the Second World War. Unbeknownst to his family, Germaine is a widower with a 5-year-old daughter. Old sibling rivalries resurface. A former girlfriend—currently dating Germaine’s brother Roger—enters the picture. The family business is threatened by politicians in Madison considering legislative limitations on commercial fishing. Nestled within the larger narrative of Fisherman’s Beach is a beautifully evoked coming of age tale of ten-year-old Reuben LeMere. It’s a chilling moment when Reuben receives a 22-calibre rifle for his eleventh birthday, and, tiring of target practice with tin cans, begins “to want to kill something.” In the grip of bloodlust, he recklessly fires at seagulls overhead. 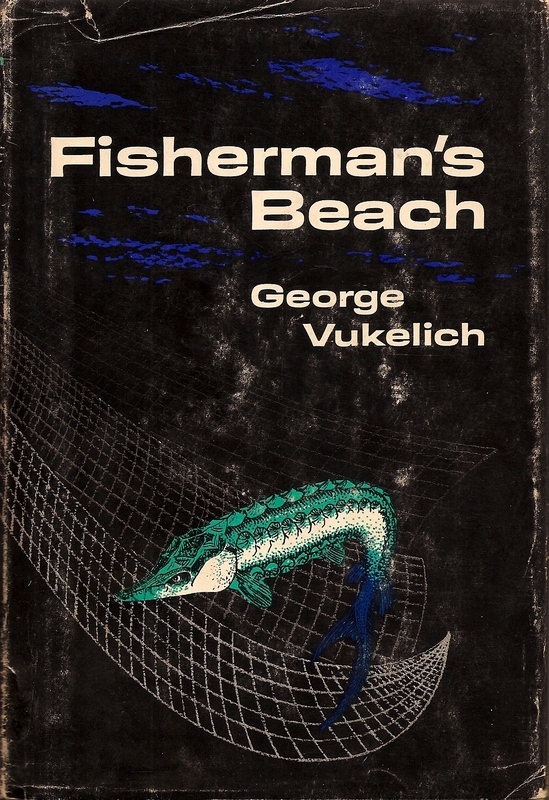 Fisherman’s Beach is George Vukelich’s only novel. 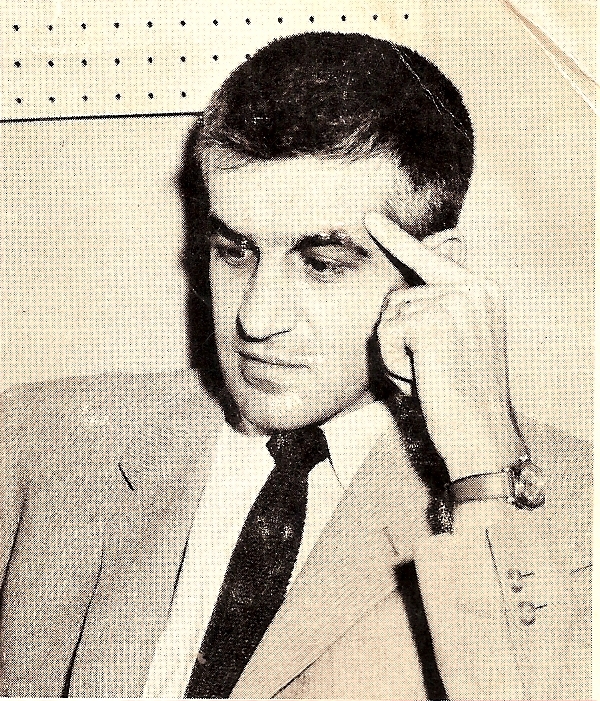 He had a long career as a journalist and essayist and radio host in Madison. He published two strong collections of his essays, North Country Notebook, Vol. I (1987) and Vol. II (1992). There’s a useful biographical sketch of Vukelich in James Roberts’ 2002 book, Famous Wisconsin Authors (online at Google Books).